Engage: Turn your head slightly so that your right ear is toward the speaker as a way to ensure that you are engaged solely in listening. Replay: Think about what the speaker is saying. Analyze it and paraphrase in your mind or in discussion with the speaker and other classmates. Replaying the information will aid in understanding and remembering what you have learned. 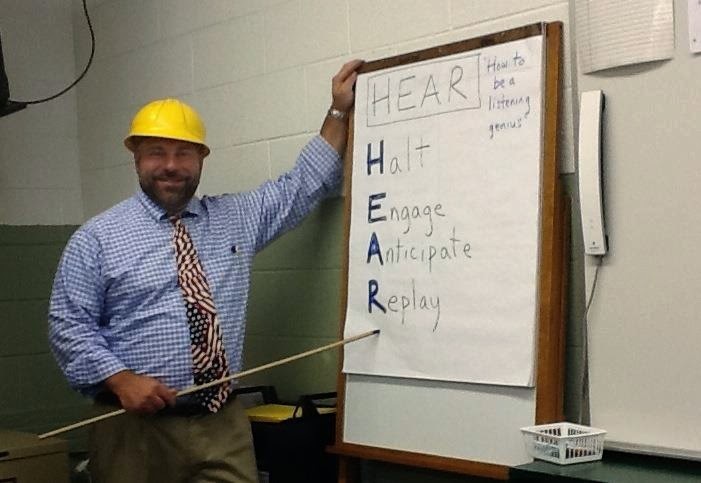 In the past, Aaron has taught the HEAR strategy to his third- and fourth-grade students while wearing a hardhat to emphasize that learning how to listen takes hard work. However, he stressed that it is worth the effort since listing is an essential skill for achieving success in school and in life. I wholeheartedly concur and love the hardhat analogy. Let’s help policymakers understand that building students’ mind/brain systems is an important kind of building that must be supported across the nation, states, and communities!